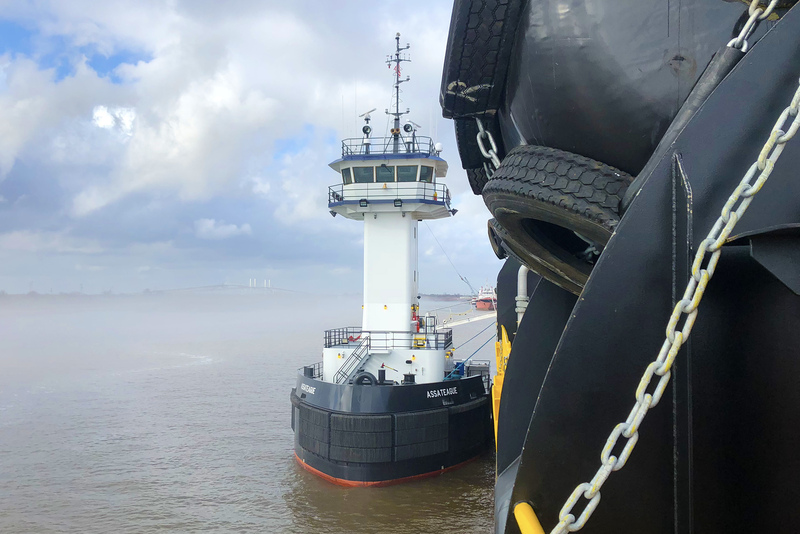 The first of three articulated tug/barge (AT/B) units ordered through Conrad Shipyard was delivered to Vane Brothers in February and has been assigned to the company’s Philadelphia-based Charlie Fleet. The 4,400-horsepower tug Assateague, constructed at Conrad’s Orange, Texas, facility, is paired with the 80,000-barrel barge Double Skin 801, which Conrad built in Amelia, Louisiana. Designed by Greg Castleman of Castleman Maritime, the Assateague measures 110 feet long by 38 feet wide and utilizes a Beacon Finland JAK 700 coupling system to connect with the DS-801, which is a 405-foot-long, 74-foot-wide barge designed by Bristol Harbor Group. The Assateague is powered by a pair of Cummins QSK60M, Tier 3 engines, each rated at 2,200 horsepower. Four-blade bronze propellers, measuring 102 inches apiece, are turned by Reintjes WAF 873 gears with 7.087:1 reduction. The Assateague is named for a barrier island located within the borders of both Maryland and Virginia. Up next is the tug Chincoteague, named for a barrier island in Virginia, followed by the Wachapreague, a Virginian coastal town. Each tug will be paired with the barges DS-802 and DS-803, respectively. Shepherding the AT/B projects to completion requires the combined oversight of Port Captain Jim Demske on the tug side and Steve Magdeburger on the barge side.